A Man was left in a difficult situation after his side chick appeared at his wedding ceremony wearing her own wedding dress. A video, which has been circulating on social media recently, shows the man in a very sticky situation. In the video, the groom is shown desperately trying to calm one bride down, while the other bride watches from the sidelines. The bride is having none of it. 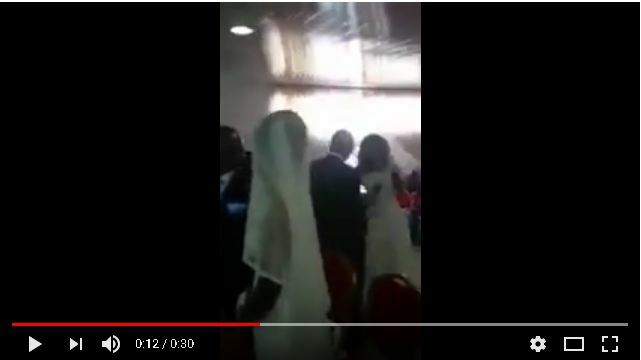 It is not clear who the main bride on the video is, but what is clear is the frustration of one of the brides. While it is not clear where the video was recorded, social media users did not hesitate in mocking the groom’s sudden misfortune! “Some people’s lives are so dramatic you’d swear they on Telemundo ,” @Vmathlakule tweeted. “Maybe the guy told her, he was getting married and forgot to tell her,he was getting married to the main chick.” Tweeted @Mabitsela_Ally. “Well done side chick!!! You did a good job,” said @BongathiniMbat2.